The stem is round with white longitudinal veins, light-green, and covered with light fine hairs. The leaves are diamond-shaped, rough, and reddish-green. The flower head is branched, tall, and is composed of very small greenish-white to green flowers. The weed has a pinkish to red taproot, hence one of its known common names. The stem is stout, fleshy, smooth, and reddish. The leaves are simple and arranged alternately and often have v-shaped variegation (coloration). The flower head is composed of closely-packed clusters of small purplish or green flowers. Sharp spines are present at the leaf nodes and at the base of the flower head, hence the name. The stem has small fine hairs and green or reddish-purple at maturity. The flower head has more branches that are compacted and much longer than the other species. It also has the green or reddish-purple color at maturity. The stem is smooth, without hairs and erect. Its color varies from light-green to dark-red with multiple shades, sometimes on the same plant. The leaves are smooth, glossy, long and narrow, and somewhat rounded. It is not easy to identify the various amaranth species. Ask for assistance from your local agricultural offices or from weed experts. The weed is an alternate host for beet armyworm and other insects, nematodes, and viral diseases. It can reduce yield by up to 40% on corn and soybean if not properly controlled. 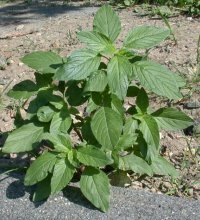 The plant is edible and has medical value. The leaves are eaten raw or cooked. The whole plant is used to cure wounds. Seed oil is used as an ointment for burns, rashes, and acnes. Several studies show that most amaranth species are resistant to most herbicides. Livid amaranth is found to be resistant to Atrazine on some corn fields in France; to Paraquat on vegetables in Penang, Malaysia; and to Imazethapyr on cabbage, lettuce, and onion in New Jersey, USA. Redroot pigweeds are found to be resistant to Atrazine, Metribuzin, Diuron, Linuron, Simazine, Imazaquin, Cyanazine on some asparagus, corn, potato farms, croplands, orchards, and vineyards in some parts of China, Europe, and USA. Smooth pigweed is found to be resistant to Atrazine on some corn farms and croplands in France, Israel, Italy, Spain, and South Africa; to Simazine in some vegetables areas in Switzerland; and to Chlorimuron-ethyl, Imazamox, Thifensulfuron-methyl, and Imazethapyr on corn, soybean, vegetables, and croplands in some states of US. Waterhemp is found to be resistant to Atrazine, and Imazethapyr on soybean in Canada; to Acifluorfen-Na, Atrazine, Fomesafen, Imazamox, Lactofen, Chlorimuron-ethyl, Imazethapyr, and Thifensulfuron-methyl on alfalfa, corn, grain sorghum, soybean, and croplands in some states of US (Weed Science, 2005).